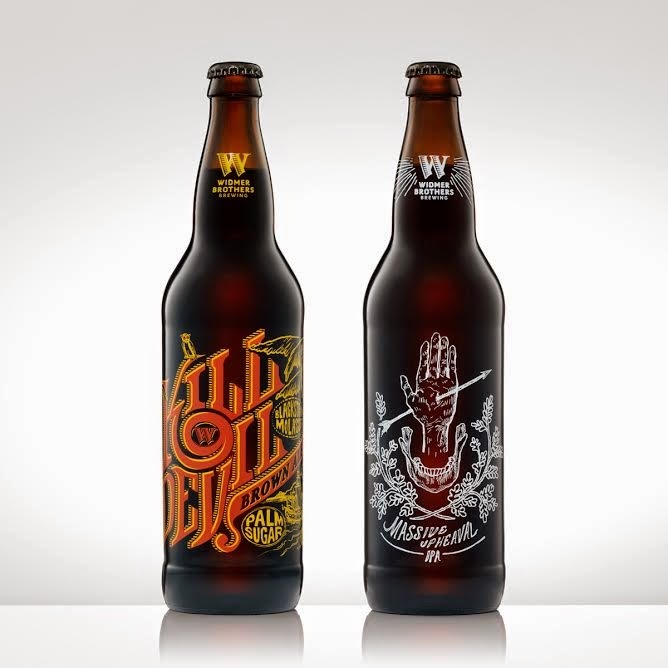 PORTLAND, Ore. – April 17, 2015 – Widmer Brothers Brewing today announced the last two beers in the 30 Beers for 30 Years Series: Kill Devil Brown Ale, which represents the year 2012, and Massive Upheaval IPA, representing 2013 in the brewery’s 30-year history. The two beers mark the conclusion of the ambitious year-long small batch series. The 30 Beers for 30 Years Series began one year ago on Widmer Brothers’ 30th Anniversary, April 2, 2014. Every month throughout the last 12 months, Widmer Brothers brewed significant recipes in small batches at the innovation pilot brewery at the Rose Quarter, each representing individual years in the brewery’s history. Each beer also features unique label art from 30 different artists and graphic designers from the Portland area; each artist chose a beer, learned about its origins, and created their own graphic interpretations in the form of a bottle label. In total, thirty different beers were brewed and bottled at the brewery’s 10-barrel pilot brewery. 30 artists were commissioned, creating 30 unique pieces of art. Bottles were released monthly in batches of two to four, and 30 cases of each beer were distributed in the Portland area only from April 2014 to April 2015. For the last two releases in the series, Widmer Brothers brewed two of the biggest beers in the series. Kill Devil Brown Ale – a rum-barrel-aged imperial brown ale brewed with palm sugar, two kinds of molasses, and Calypso hops – was originally released as part of the Brothers Reserve Series in 2012. Massive Upheaval IPA is the last beer in the series and the second series release that wasn’t previously brewed and distributed in some fashion. Massive Upheaval is a look to the future as Widmer Brothers took the recipe for Upheaval IPA, which was developed in 2013 and released in the year-round lineup in February of 2014, and brewed a bigger, imperialized version for the 30 Beers for 30 Years Series. Samuel Robinette of Accidental Color created the Kill Devil Brown Ale label, and John Fish of This is Folklore created the Massive Upheaval IPA label. The two labels, and all label art from the series, can be found at 30Beersfor30Years.com. Widmer Brothers is hosting a wrap-up party for the 30 Beers for 30 years Series today at the White Owl Social Club in southeast Portland. The party will go from 3:00 p.m. to close, and will feature beers from the series and displays of all label artwork. Many of the artists will be in attendance, as will various brewers from Widmer Brothers. Kurt and Rob Widmer will make an appearance, as well. For more information on Widmer Brothers Brewing, please visit widmerbrothers.com or see what the brewery is up to on Facebook, Twitter, and Instagram. In 2013, we began brewing an unfiltered, unexpected, unapologetic and uncompromised IPA called Upheaval IPA. We’ll be launching this beer in early 2014. For the 30 Beers for 30 Years project, we’ll brew a bigger, bolder, badder version of Upheaval to celebrate the launch of this new year-round IPA.